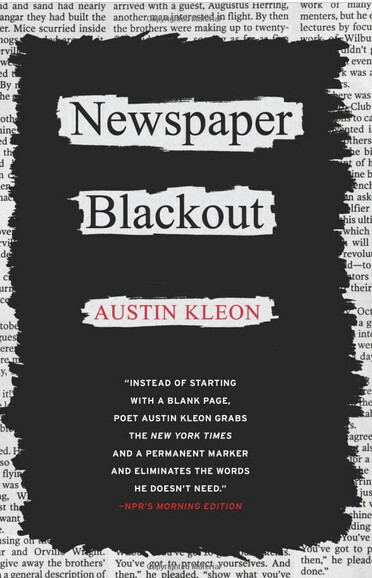 I posted to Twitter that I finally tried Austin Kleon’s Newspaper Blackout with my writing class. An awesome teacher, Kathy in AL, wrote to ask me how I did the lesson with my class. She also reminded me that I’ve been on Twitter a lot, but haven’t put anything here in forever. Thanks for that, too, Kathy! I’m going to get back to this blog! I showed my 8th graders several of his videos to start. Next, I read several of his poems and showed them to the class. We then did a few together on the smartboard (I scanned in a few newspaper articles that I thought would work). I did a few of my own to show them. Some kids really got it and others just liked writing with the black markers on the newspaper! 🙂 Either way, I think it was a valuable writing activity. It did take a lot longer than I thought it would. I planned it for one day, but they worked on it for several days. Let me know if you try it with your students!